This year, 2017, the Alabama Law Foundation marks its 30th anniversary–30 years of providing civil legal services to Alabama’s citizens in need and 30 years of building the financial foundation that enables that service. When the Alabama Law Foundation was founded, its financial foundation was IOLTA-Interest on Lawyers Trust Accounts. The IOLTA program allows attorneys to convert their commingled client trust accounts to interest-bearing accounts. This interest then is disbursed to the Alabama Law Foundation, and a grants committee distributes the funds to law-related charities across Alabama. It was the late 1980’s and interest rates on IOLTA accounts were nearly 5%, allowing the foundation to award $12 million in grants over its first 15 years Times were good for retirees living off CD’s, but high interest rates made it cost much more to take out a mortgage or buy a car. However, the Fed Funds Rate dropped from 6% at the beginning of 2001 to 1.25% at the end of 2002. This meant that interest rates on IOLTA accounts dropped precipitously as well. Interest rates remained low for several years, reaching the point that only $118,000 was available for grants in 2004. At that point, board of trustees member Irving Silver initiated discussion on creating a permanent endowment for the Alabama Law Foundation to guard against interest rate fluctuations and to ensure meeting its responsibility to Alabama’s citizenry. In late 2005, Alabama Law Foundation President John Owens asked Sam Franklin and Irving Silver to co-chair a development committee to take the lead in building the Alabama Law Foundation’s endowment. The result was the formation of the Atticus Finch Society, a giving society that became the third footing of the foundation’s financial foundation. The endowment created has helped stabilize the Alabama Law Foundation’s grant program by providing a permanent source of grant funding that will grow over time. We do not use the principal of these funds because they are a permanent source of funding. Now when the foundation makes grants each year, we add 5 percent of the value of our permanently invested funds to other funds available for grants. In 2017, these funds were 33 percent of grant funds. When IOLTA account interest rates dropped to near zero percent due to the Great Recession of 2008, the foundation realized we had to broaden our sources of funding. The final three footings in our financial foundation are general contributions made by bar members, pro hac vice fees and the bar dues checkoff. Combined they generated 33 percent of the foundation’s revenue in 2016. Thanks to the steps the foundation has taken to build a strong financial foundation, we will be able to provide a stable source of funding for Alabama’s civil legal aid providers. Even through the difficult financial times of the past 10 years, Legal Services Alabama and the Volunteer Lawyers Programs have increased the number of cases they closed from 10,527 in 2007 to 15,023 in 2016. Alabama’s funding for civil legal aid is still the lowest in the country, but we now have nowhere to go but up. To continue the theme of last year’s annual mailing, Onward and upward! The Alabama Law Foundation’s yearly grants support programs committed to the foundation’s mission of making access to justice a reality for all of Alabama’s citizens. 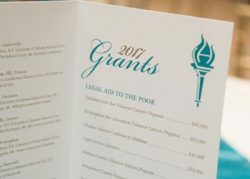 The 2017 grants were in three sections: Legal Aid to the Poor , Administration of Justice, and Law Related Education. The grants for 2017 totaled $512,500. The Alabama State Bar Volunteer Lawyers Program which refers cases directly to lawyers in 60 counties and coordinates 2,0l1 volunteers, received an $80,000 grant. The Birmingham Volunteer Lawyers Program, which refers cases to 626 attorneys in the Birmingham area, received an $85,000 grant. The Hispanic Interest Coalition of Alabama received a $45,000 grant to continue providing low-cost, quality legal and immigration services to low-income immigrants. Legal Services Alabama (LSA), which provides legal aid to economically disadvantaged citizens throughout Alabama, received a $50,000 grant. The Madison County Volunteer Lawyers Program works with 405 lawyers and received a $45,000 grant. The Montgomery County Volunteer Lawyers Program, which works with 390 lawyers to meet the legal needs of low income clients in Montgomery County, received a $45,000 grant. The South Alabama Volunteer Lawyers Program, which refers cases directly to 846 lawyers in Mobile, Baldwin, Clarke, and Washington counties, received a $60,000 grant. The YWCA of Central Alabama received a $60,000 IOLTA grant to continue the “Justice on Wheels” program for victims of domestic violence in Blount and St. Clair Counties. The foundation’s legal aid grant recipients closed 16,039 cases in 2016. The Equal Justice Initiative of Alabama, which assists attorneys appointed to capital cases in the post-conviction stage and supplies some representation to indigent defendants, received a $40,000 IOLTA grant. The Birmingham International Education Film Festival received $2,500. The Alabama Law Foundation begins each year by recognizing the Alabama Bar members who have demonstrated outstanding dedication to their profession and their community by inviting them to become “Fellows.” The Fellows banquet was held in their honor on Saturday, January 28, 2017 at the Renaissance Hotel in Montgomery, Alabama. 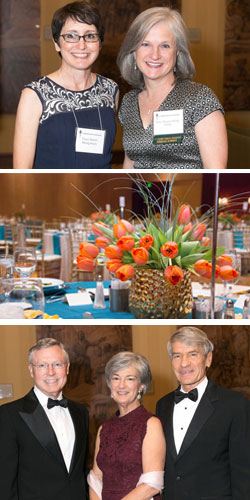 The Fellows program was established in 1995 to honor Alabama Bar members for outstanding service and commitment. Since no more than 1% of bar members are invited into fellowship, the selection committee chooses new members from an exceptional group of lawyers. President Board of Trustees of the Alabama Law Foundation Joe Fawal explains, “The Fellows of the Alabama Law Foundation are selected from the ranks of the Alabama State Bar and represent our brightest and best. The fact that they are selected is in and of itself an honor. But the contribution that they make in defense of the poor in civil matters in Alabama is a much greater honor.” Fellows are given the opportunity, as leaders in the legal community, to provide financial and personal support for the Alabama Law Foundation, the charitable arm of the Alabama State Bar. Cassandra W. Adams, Hoover– Fisk University, B.A. University of Tennessee College of Law, J.D. Director of Community Mediation Center for Samford University, Cumberland School of Law. John E. Burbach, Huntsville– University of Alabama, B.S. Cumberland School of Law, J.D. Shareholder in Carr Allison. Michael G. Graffeo, Birmingham – University of Alabama at Birmingham, B.S. University of Alabama School of Law, J.D. Circuit Judge, 10th Judicial Circuit. Shelbonnie Coleman Hall, Mobile – Florida A&M University, B.S. Florida State University, M.S.W. University of Tennessee College of Law, J.D. City of Mobile Municipal Court Judge. R. Austin Huffaker, Jr., Montgomery – Vanderbilt University, B.E. University of Alabama School of Law, J.D. Shareholder in Rushton Stakely Johnston & Garrett. George R. Irvine, III, Daphne – Washington & Lee University, B.A. University of Alabama School of Law, J.D. Partner in Stone Granade & Crosby. Lynn W. Jinks, III, Union Springs – University of Alabama, B.A. University of Alabama School of Law, J.D. Partner in Jinks, Crow & Dickinson. G. David Johnston, Dothan – Birmingham Southern College, B.A. Cumberland School of Law, J.D. Partner in Johnston, Hinesley, Flowers, Clenney & Turner. William H. King, III, Birmingham – Washington & Lee University, B.A. Vanderbilt University, J.D. Associate in the Southeastern Conference. Forrest S. Latta, Mobile – Troy University, B.S. Cumberland School of Law, J.D. Partner in Burr & Forman. Steven T. Marshall, Guntersville – University of North Carolina, B.A. University of Alabama School of Law, J.D. District Attorney of Marshall County – 27th Judicial Circuit. Charles A. McCallum, III, Vestavia – University of Alabama, B.A. Cumberland School of Law, J.D. Partner in McCallum Hoaglund Cook & Irby. Apsilah O. Millsaps, Tuscaloosa – Dartmouth College, B.A. University of Alabama School of Law, J.D. Partner in Owens & Millsaps. Phillip D. Mitchell, II, Decatur – Jacksonville State University, B.S. University of Alabama School of Law Partner in Harris, Caddell & Shanks. James L. Noles, Jr., Birmingham –United States Military Academy, West Point, NY, B.S. University of Texas School of Law, J.D. Partner in Balch & Bingham. Jeanne Dowdle Rasco, Huntsville – Auburn University, B.S. University of Alabama School of Law, J.D. Assistant City Attorney, City of Huntsville. Allison O. Skinner, Birmingham – University of Alabama, B.A. University of Alabama School of Law, J.D. Founding partner in Skinner Neutral Services. Elizabeth C. Smithart, Union Springs – Huntingdon College, B.A. University of Alabama School of Law, J.D. Sole practitioner. Ms. Smithart is married to Burt. Will Hill Tankersley, Jr., Birmingham – Washington & Lee University, B.A. University of Alabama School of Law, J.D. New York University School of Law, LL.M. Partner in Balch & Bingham. Albert J. Trousdale, II, Florence – Birmingham Southern College, B.S. University of Alabama School of Law, J.D. Partner in Trousdale Ryan. C. Gibson Vance, Montgomery – Troy University, B.A. Jones School of Law, J.D. Partner in Beasley Allen Crow Methvin Portis & Miles. Mr. Vance is married to Kate. Lawrence B. Voit, Mobile – University of Alabama, B.A. University of Alabama School of Law, J.D. Partner in Silver, Voit & Thompson. James N. Walter, Jr., Montgomery – Washington & Lee University, B.S. University of Alabama School of Law, J.D. Shareholder in Capell & Howard.